I don't think there was anybody in New Orleans in the 60s who was as active in the studio as the genius Wardell Quezergue. Of course he was mostly there as an arranger but he did produce some sides and also owned his own Big Q label which released music by the likes of Joe Wilson and Clemmon Smith. 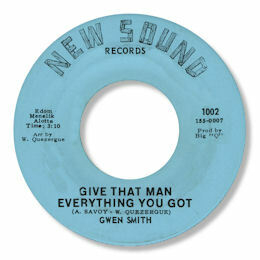 One of the 45s he produced was this one by Gwen Smith. She only seems to have recorded this single rare release - but her vocal talents were much more highly developed than some of the other women from the city who recorded more prolifically. Check out her hoarse tones and impassioned wailing on Give Your Man Everything You Got especially from the second verse onwards. Gwen was a gal who could really sing. It's a good job she could as Wardell's arrangement and production is amongst the most perfunctory he ever laid down - just a rather cheesy organ, guitar, bass and drums. But the guitarist at least shows he was trying as he plays some first rate licks. What a shame Gwen didn't record more tracks like this.